A British man who works as an English teacher at a university in Thailand has denied murdering his Thai wife, whose remains were found in moorland in England in 2004. The woman’s body was found by walkers Horton-in-Ribblesdale in the Yorkshire Dales in northern England who had unwittingly been posing for photos alongside, without realising what it was. For 15 years, mystery surrounded the identity of the woman, who was dubbed 'Lady of the Hills', and whose case featured widespread coverage in the UK as the authorities attempted to identify her. But due to a breakthrough in DNA, and with the help of the authorities in Thailand, the woman was recently identified as Lamduan Seekanya. Now The Sun reports that police in the UK are investigating Lamduan’s marriage to British man David Armitage, 55, who is now in Thailand where he works as an English teacher at Rajabhat University in Kanchanaburi. Last month, following a cold case review and publicity in the Thai media, an elderly couple living in Udon Thani came forward saying they believed the ‘Lady of the Hills’ was their daughter, Lamduan, who they last heard from in 2004 and who had moved to the UK in the 1990s after meeting a British man. 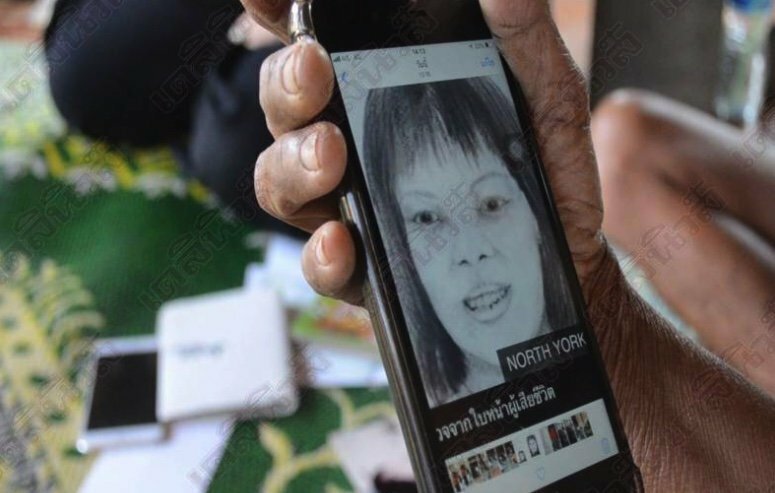 Joomsri Seekanya, 72, said her daughter posed a striking resemblance to a sketch issued by police in one of the appeals to identify the ‘Lady of the Hills’. Mrs Joomsri told police her daughter, who had two children with David Armitage, would now be 52, and that contact with her stopped abruptly in 2004, around the time the body of the ‘Lady of the Hills’ was found. Police initially thought the woman, who was found half naked, had died of hyperthermia after becoming lost on the hills. An open verdict was later recorded at an inquest to her death. However, a cold case review in 2016 suggested the woman was killed and police in the UK investigated the possibility she was a ‘Thai bride’ who had moved to England and was killed. Forensic tests which were not available at the time, later found that Lamduan had spent time living in a rural area of south Cumbria or northern Lancashire. Sounds guilty as hell to me. He told his son that his mother had gone back to Thailand to marry someone else. When the son went years later to his grandparents in Udon to find his mother the dots began to be connected. Of course, there's also zero mention of the article of what if anything this British guy did in the wake of his wife's 2004 unexplained disappearance. If he did nothing and just quietly ran off to Thailand, that itself would be one indicator of his potential guilt. I also think this looks extremely suspicious. Innocent until proven guilty but if I was on the investigating team he would be my prime suspect. Sound very fishy Mr David, if my wife went ''missing'' in my home country while I was there then I returned to live in Thailand, even if the parents didn't speak English I would go see them and let them know the kids will be ok and so on. Its good that the Thai parents finally know what happened to their daughter. Convicting the UK guy will be hard as its so long ago that almost all evidence will be gone. All this guy has to do is deny it and he might get away with it. True but this is Thailand, net citizens play a bigger role than evidence, once Big Joke gets a sniff he'll coma knocking! Thai police have a way of getting confessions. It looks like his own kids will take him down. Thai police interrogation methods should extract a confession quick smart. Huge success rate. Would have been very telling to see his reaction when he was told that his Wifes body had been identified . Torture, more often than not, produces false confessions. Additionally, as this crime was committed in the UK, Thai Police only have the power to arrest, detain and deport him after a request from the UK. Any confession over here would be inadmissible in the UK. Given the apparent lack of evidence available I would suggest this is unlikely to happen. Talk of Thai Police extracting confessions etc. is a nonsense. He's probably going to lose his job and possibly get deported anyway, I think a lot may hinge on his kids. Thaigeezer Clouseaus on the case- it will be solved in minutes! i'm just glad the poor woman's family will have a body to grieve and maybe get some closure at last. However regardless of guilt or innocence I would be more concerned re family trying to get even might be worth moving anyway, for self preservation. A shred of evidence might be useful. Bring him in for questioning. Well if she left him and went to Thailand she would not have been found in England. Did he report her missing in England? Did he do the usual things you do for a missing person? Like verify they actually left the country? Was she declared dead by being unfound for X number of years? Did England not question his leaving with his wife disappeared?